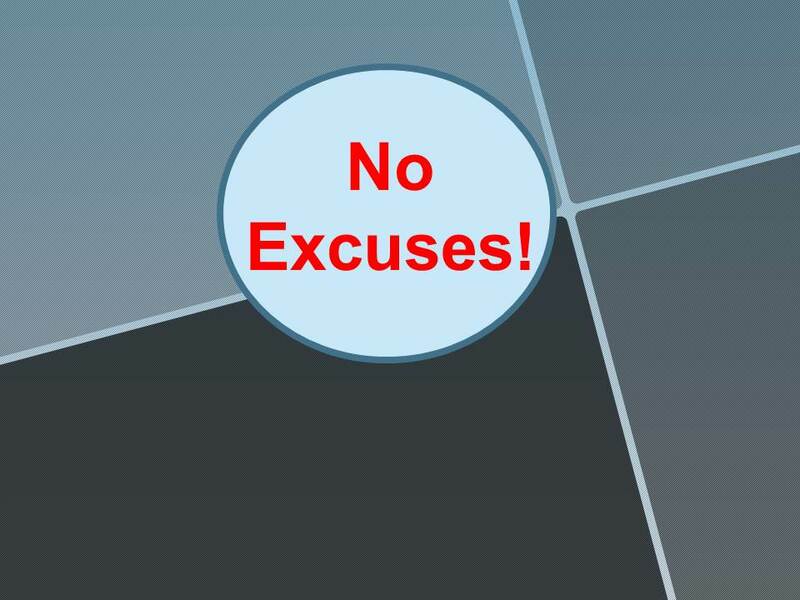 I have been working on an article lately called “Excuse Makers” and guess what my pastor spoke about today? Making excuses. I couldn’t believe it! What were the chances? The context that he was discussing centered on health and diet as well as our spiritual life. He gave a list of the many excuses that individuals give for not eating well or taking off the extra weight that can create health issues. He has been doing a series called Wholly Fit which has changed the lives of some of our parishioners. Wholly Fit means addressing your health and diet and . . . your spiritual side. I’ve watched some dear, dear friends of mine over the last two years, not one year but two, endure some pretty horrible things and I’ve noticed something that sets them apart. Even when a parent died, when a sister became severely ill while the caretakers themselves suffered from a major disease (sometimes all at the same time), if they nursed someone around the clock, if the day ran out of hours, they never made excuses. They always found the time to do the right thing or take care of what needed to be handled. That’s what sets apart winners from lesser achievers, I think. The winners view each waking moment as a time to be productive no matter what is going on around them. Oh granted, you can’t be nursing a bedridden loved one 24/7 and expect to be able to conquer the world, but there is still a way to take care of “stuff”. So, I thought how appropriate that my next article to be published is about excuses and my pastor talked about this today. His message was so strong and hit home as I, too, am an excuse maker. A clip my pastor showed today was so telling. It was a video of an exercise guru who’s well known who always asks the question, “What’s your excuse?” Next to him was a man who did the entire exercise routine on one good leg and one prosthetic leg. It was absolutely amazing watching him . . . jumping around in the air better than some people with two good legs can. Now . . . some people cannot do that if they have MS, are bed ridden, or are severely afflicted by other diseases, but just look at how we’re all conditioned to make excuses for not being able to make a phone call, for not being able to work, when there are jobs that require only a phone and there are libraries that have computers for FREE. When I talk to some of my athlete friends and how they grew up, they said that quitting was not an option as the only way “out” was by being good at a sport so that became their goal. Ever wonder how single parents do it? They do it because their kids depend on them. They find a way. Thank you Pastor Russell for pointing out our many excuses for not “getting on with it.” Guilty as charged. I am going to try harder. I promise. « Why Are Wedding Invitations Hand Written?